“Flaming June”, it’s known as. It’s late spring, about to turn into summer. Well, above was the scene from our lounge window on the Reffley housing estate in King’s Lynn this morning. The wind was bending the trees this way, then that, and the raindrops slithered down the pane. Not the greatest of starts for “30 Days’ Wild”, but I suppose this weather is wild in a way – stormy wild! However, a short while later, during a lull in the showers I ventured out of the back door and was astonished to see a small black and yellow bee feeding from a geranium. I thought the weather was too windy and chilly for bees to be out and about. However, the plant was in a sheltered area, in a corner near a fence. The intrepid creature wasn’t perhaps as lively as it might have been in hot sunshine, but that at least helped me to get a photo of it while it tried a number of different flower heads. 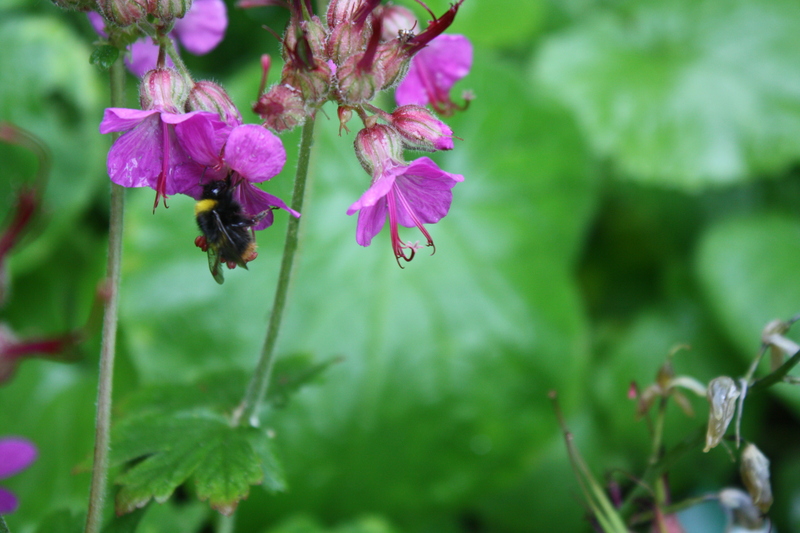 This hungry bee was a cheerful sight on a miserable day. I hope the bee managed to find enough food to get through the day.It was certainly a cheering sight to see.